Early or premature foliar discoloration is a general symptoms of this disease. Photo by Russ Ingham, 1985. Cause Pear decline is caused by Candidatus Phytoplasma pyri transmitted by pear psylla or by grafting infected stock to healthy trees. The pear psylla acquires the phytoplasma after a few hours of feeding and remains infective for the rest of its life. Grafting and budding can also transmit this phytoplasma. Decline is much more prevalent on trees with rootstocks of Pyrus ussuriensis or P. pyricola than on trees propagated on domestic P. communis roots. The pathogen survives from season to season in the roots of infected trees. The phytoplasma population in the aboveground portions of the tree fluctuates through the year. The pathogen does not survive in aboveground phloem elements in late fall and winter but rebounds from root reservoirs once new phloem tissue is made in the spring. The dwarfing Quince rootstocks have been highly tolerant of this disease. For example, Comice on quince BA-29 has been very successful. The cultivar William is incompatible with quince and will weaken and die a few years after planting. The Farold series 40, 69 or 87 (also known as 'Old Home x Farmingdale') are a highly tolerant alternative when grown on well-drained soils. Quick decline symptoms result from additional stress acting directly on roots (usually Phytophthora or Pythium root rot). Leaves turn red early due to starch accumulation in the upper tree. Symptoms Pear decline is characterized by two phases. Quick decline is where trees wilt, scorch, and die in a few weeks. It is often preceded by slow decline and reddening. This quick decline occurs on very susceptible rootstocks such as P. ussuriensis and P. pyricola. Slow decline is where trees lose vigor over several seasons during which foliage gets sparse with little or no terminal growth and leaf size is reduced. Fruit set and size also decline. 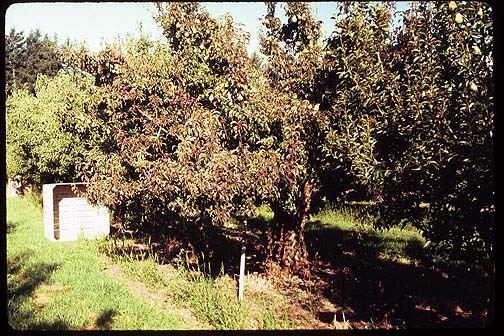 Slow decline occurs on more common rootstocks such as P. communis, P. calleryana, P. pyrifolia, P. betulaefolia, and Cydonia oblonga. An abnormal, early red leaf coloration has been observed frequently on affected trees due to root damage. Reddening may or may not accompany either slow or quick decline. Reddened leaves may curl downward with margins rolled upward. Leaf veins may be thickened with crinkled leaves that drop sooner than normal leaves. Reduced root systems may occur with all phases of the disease. Graft incompatibility, root rots, and winter injury can be mistaken for pear decline. Use resistant or tolerant rootstocks. Remove infected trees from nurseries and young orchards. Collect hardwood cuttings or scion stock in the winter or early spring. Use the best orchard management practices, including the best possible insect and disease control, irrigation, drainage, fertilization, and pruning. Control pear psylla. See the PNW Insect Management Handbook for details. When grafting Asian pear trees over to European (P. communis) cultivars, graft below the union of the Asian pear with its rootstock to avoid creating a highly decline-susceptible tree. Reference Hadidi, A., Barba, M., Candresse, T., and Jelkmann, W. 2011. Virus and Virus-like Diseases of Pome and Stone Fruits. St. Paul, MN: APS Press.